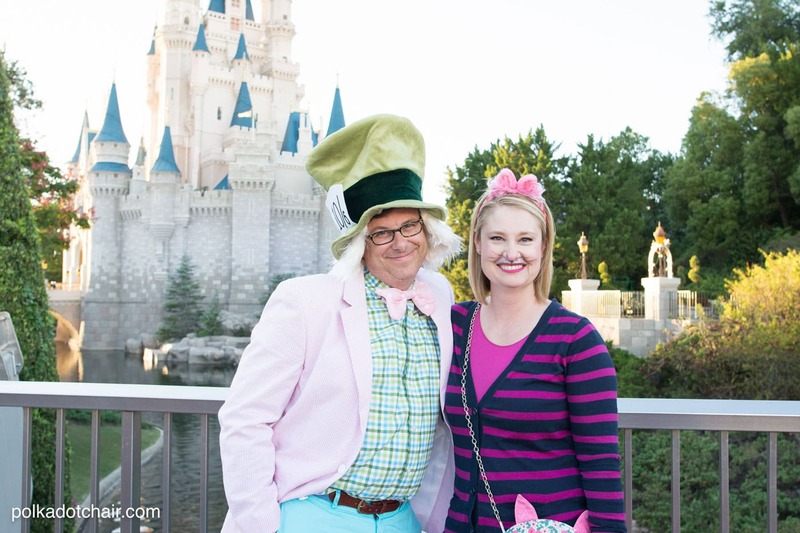 Today I have a few No-Sew Alice in Wonderland Costume ideas for you. If you’re looking for quick, last minute Halloween costume ideas these costumes may be just what you need! We just returned from a somewhat quick trip to the Walt Disney World resort in Florida. 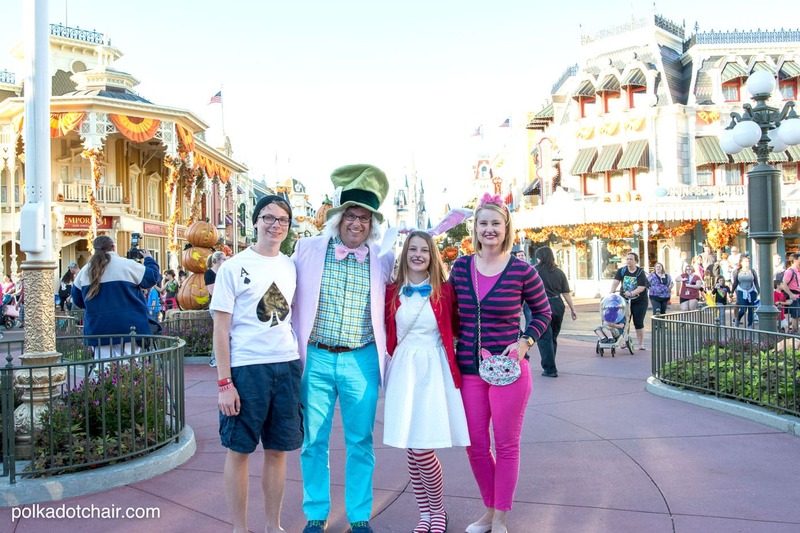 While we were there we attended Mickey’s Not So Scary Halloween party. My youngest kids are twins, and now 15 years old. 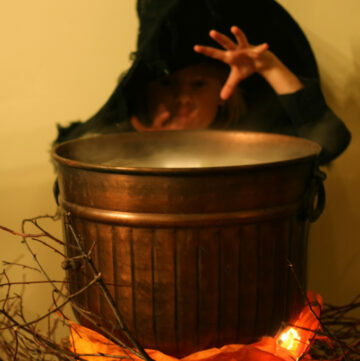 I completely admit that I’m not dealing well with the fact that they have outgrown “traditional” trick or treating. They still love to go out on Halloween night with their friends, but they aren’t too keen on us walking the neighborhood with them anymore. Last year my husband and I went out to eat for Halloween dinner by ourselves (the kids had plans with their friends) and it was the most depressing thing EVER! The restaurant was empty, we were half tempted to go walk around a neighborhood just so we could see kids all dressed up in their costumes. We don’t get trick or treaters in our neighborhood. I completely admit that our trip to Disney World is a somewhat vain attempt on my part to make the kids childhoods last as long as possible. 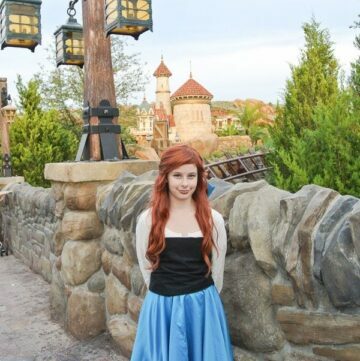 I think that’s part of why I love visiting Disney so much, it’s the one place that everyone can be a kid. Grown up’s and teens included. 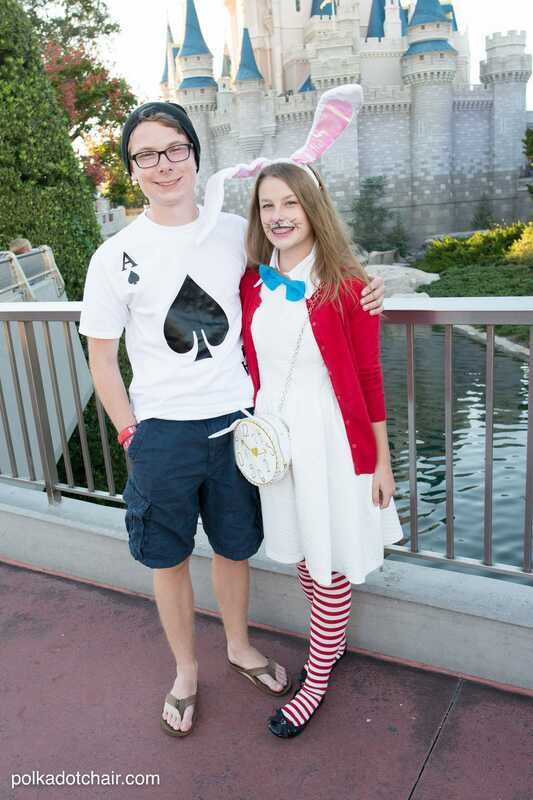 I love the Mickey Halloween party partially because almost everyone dresses up. It’s the perfect excuse to wear a costume. 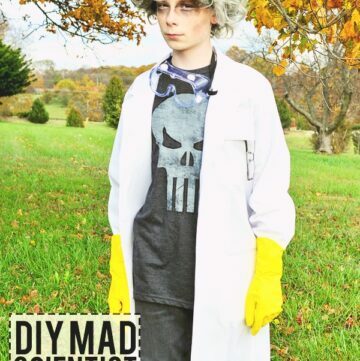 Since my kids are now older, a different type of Halloween costume was in order. Gone are the days of custom sewn costumes for them. I’ve noticed that they prefer instead to design their Halloween costumes based on items they already own in their closet. We call them “regular clothes” Halloween costumes. 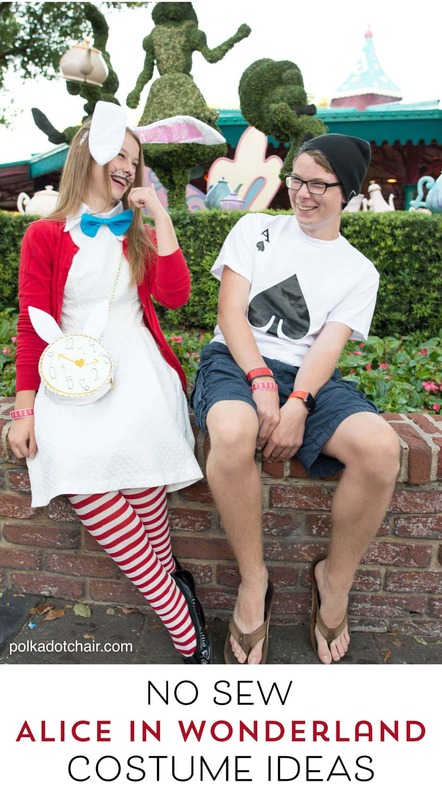 So this year we went with no-sew Alice in Wonderland costumes (and yes, I’m that crazy Mom that tries to get her whole family to “match” on major holidays, Halloween included). 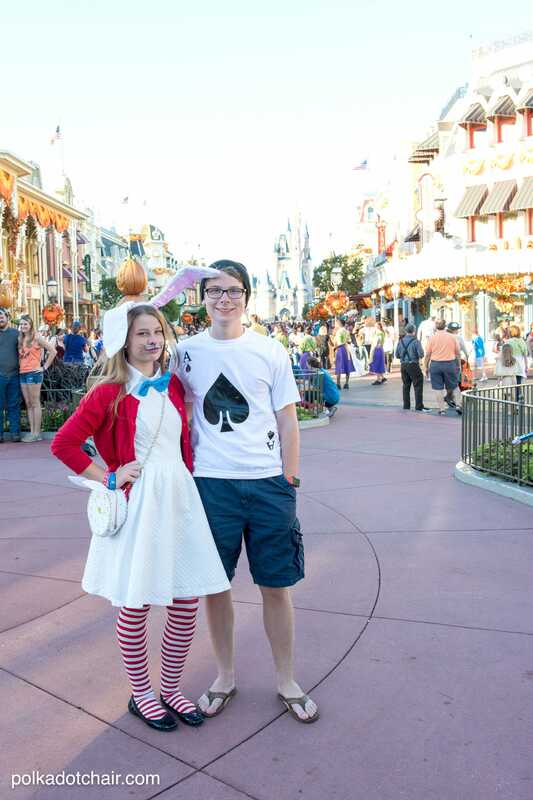 We shopped our closet and were able to come up with some pretty cute Alice in Wonderland costumes. My husband remarked at one point that it was crazy that we had all of this stuff lying around. Disclaimer: we did end up buying a few accessories to complete our outfits. 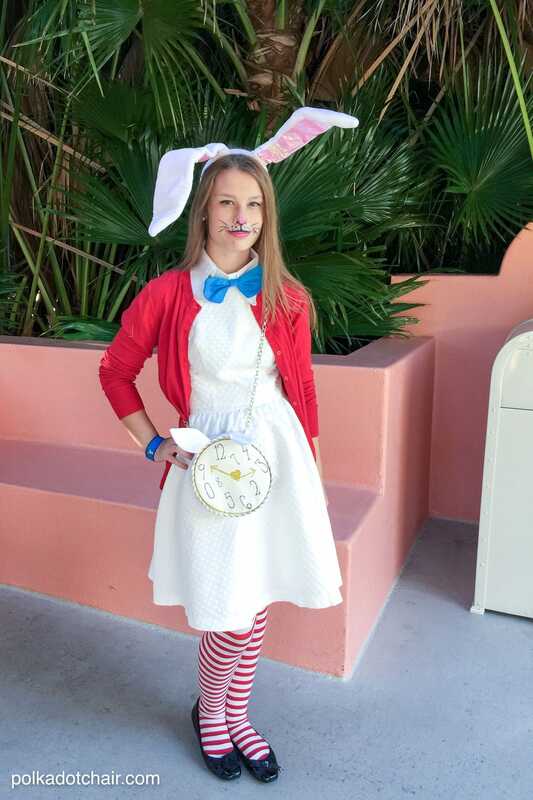 I thought I’d share with you what we came up with just in case you’re looking for a great last-minute, no-sew Alice in Wonderland costume. 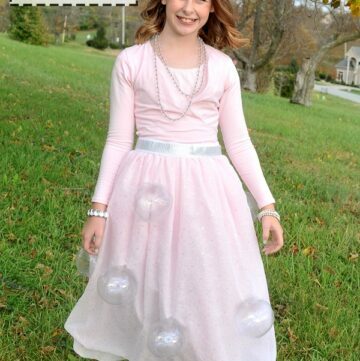 Personally, I think it is very hard to come up with Halloween costumes for teens and tweens and will take whatever ideas I can get! This costume was created by layering a plain white dress with a bright red cardigan, and I have to say that I’m pretty happy with how it turned out. 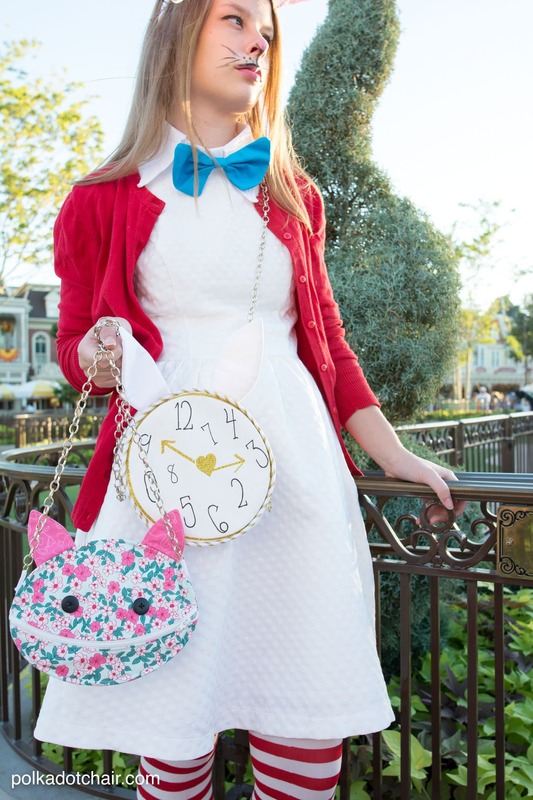 To add a bit of whimsy, we bought some red and white striped tights, and I made a custom “clock purse” for her (to get the pattern for the purse just CLICK HERE). 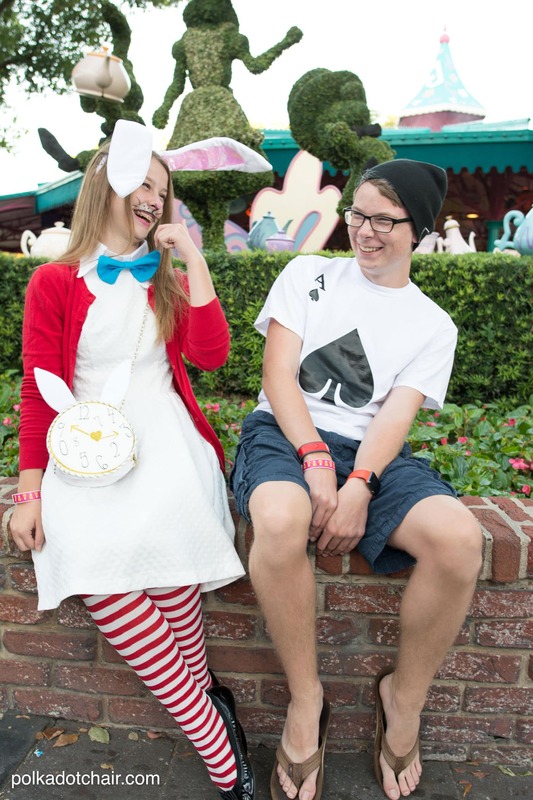 Trying to find an Alice in Wonderland Costume for a teenage boy is NOT easy. 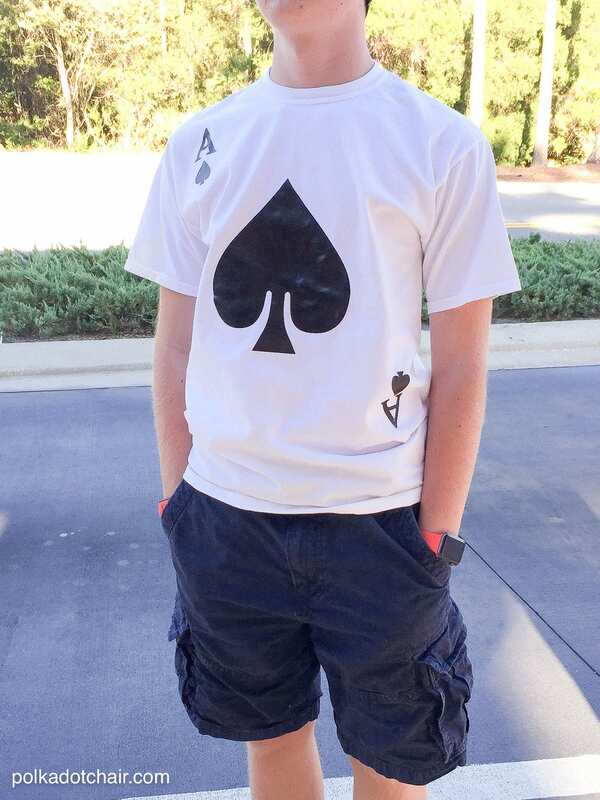 This Ace of spades t-shirt was just about as much of a costume as my son would go for, and that was just fine with me. I used my Cricut machine and some black iron-on vinyl to create the card image on the front. He then just wore a black ski cap on his head to complete the look. -Cricut Machine- Just use a standard font to create the A and a Spade in Cricut Design Space for the Center of the Shirt. 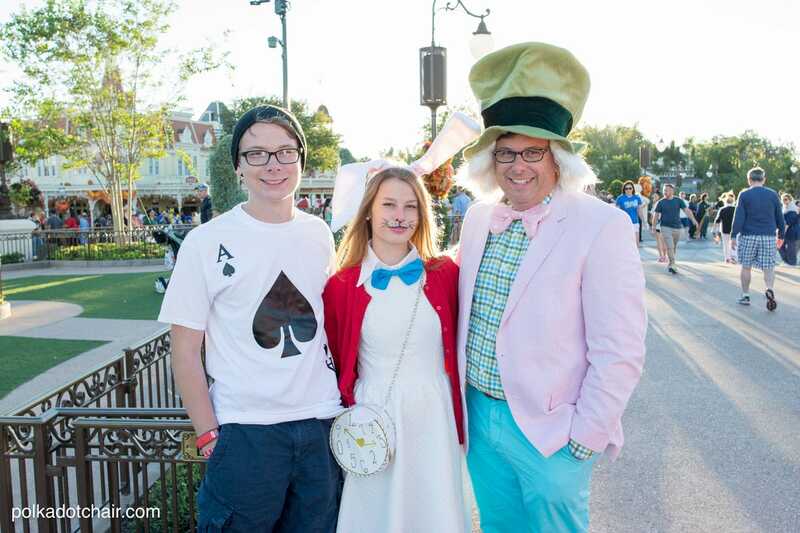 I could not decide which Alice in Wonderland character I wanted to go as. I was torn, and finally decided to go as the Cheshire Cat. For my costume, I layered a striped sweater over pink jeans then added cat ears. My husband pulled a few of the craziest items that he had in his closet and layered them all together. I think that’s the benefit of a Mad Hatter costume, you can really use whatever you have and just make sure it’s somewhat mismatched. 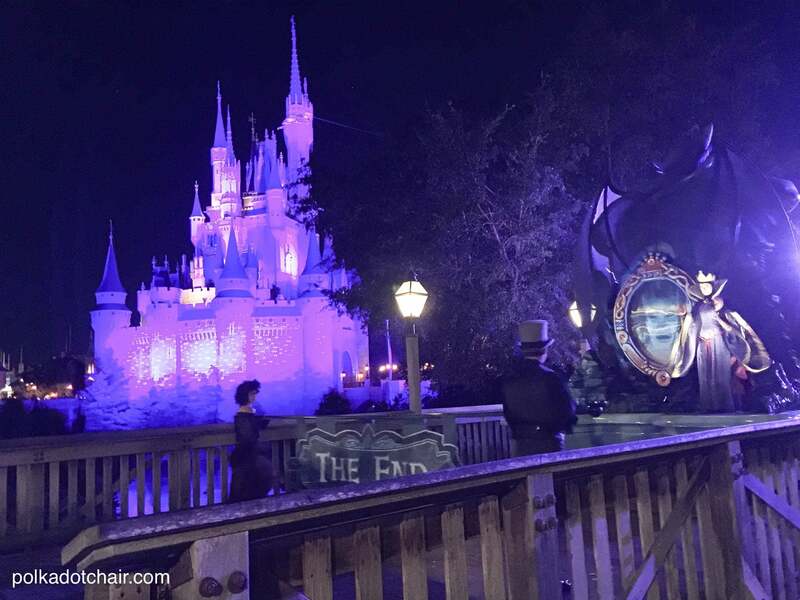 This was our 5th time attending the Disney Halloween party and we had a great time. If you’ve been a long time reader, you may remember that my son left the party in a wheelchair two years ago (you can read about that experience here). This year at the party we kept telling him that he was walking out of the park on his own, no one was allowed to get sick! Thankfully all went smoothly. I was also pleasantly surprised at the crowd level for the party. In previous years the party has felt too crowded, this year it was just right. I’m guessing that we just lucked out and went on a good night. Most rides were walk on, and the longest wait of the night was for the Mine Train ride at 30 minutes. Which is great for that ride since it’s so insanely popular. Disney has also added a lot of fun new activities to the party, we actually ended up riding fewer rides this time and spent more time watching the shows and parades. We seriously can’t wait to go back! What fun! I have never been to Disney, but this event looks like a perfect time to go! It just may have to go on my Bucket List. Love the costumes! Looks like fun! Oh I do hope you will be sharing the cat & clock purses!!! Love, love, love them!!!!! Looking forward to the patterns!